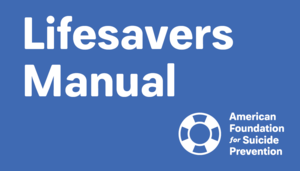 Designed to fit easily in someone’s wallet, yet containing a wealth of important information, the Lifesaver’s Manual Wallet Brochure is packed with quick tips for anyone concerned someone is considering suicide, as well as links and phone numbers to have on hand for emergencies. 3.5” x 2”. Comes in packs of 25.